I came across an interesting piece of news regarding ESPN, on Advertising Age yesterday. What was particularly interesting is its plans to launch more cross-platform / multi platform ad units. As part of this initiative, ESPN will distribute its sports content on multiple platforms – and they have the stats to prove it might just work in attracting more eyeballs and shoring up recall rates. Approx. 2.2 million interact with the ESPN app every day, and its live-streaming service has attracted 50 advertisers. ESPN is especially counting on Nielsen’s efforts to measure iPad video viewing that will allow it to convince advertisers to extend campaigns across multiple platforms by showing it the numbers. While most statistics readily available online are relatively dated, it does show that multi platform advertising, offering increased frequency (number of times a viewer is exposed to an advertising), results in higher conversion rates – click for details. 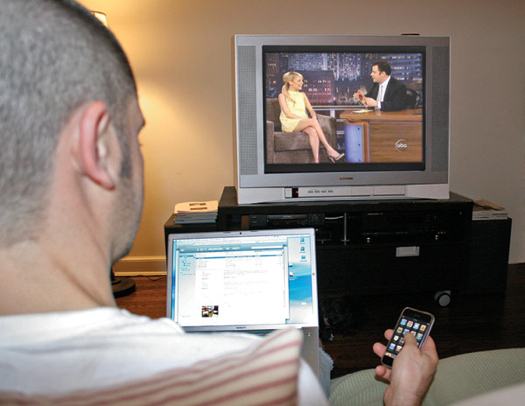 According to a Nielsen study, simultaneously surfing the web and watching TV is getting more and more common. In 2009, 12.8% of Super Bowl viewers and 8.7% of Oscar viewers simultaneously browsed the Internet, but in 2010, that number shot up to 14.5% and 13.3%, respectively. So it’s no surprise that ESPN and I imagine most/more media companies are likely to push or rather recommend multi platform campaigns to their advertisers. In fact, IBM has developed a tool for media networks to develop an effective media mix and leverage multi platform advertising. IBM® Cognos® is a cross-platform advertising transformation and analytics solution that can help firms turn unstructured data into usable business information, aiding marketers to figure out how best to invest. My perspective: Consumers of media are inundated with messages, and most know how to ignore advertising (whether getting a snack during the commercial break, ignoring the banner advertising on web pages, and hitting the forward button on the DVR). Multi platform advertising helps ensure that the advertisers message is put in front of the right audience several times so they can actually remember the campaign.